View all by Carson K.Carson K.
msmaker is an mspaint clone where you can bring your art to life in the form of a miniature platformer game! 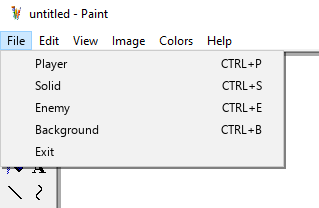 Once you create your first drawing, go to the File Menu to see what you can turn that drawing into. Player: A platformer character that you can control with the arrow keys. Enemy: An enemy that moves back and fourth that can kill a player, or be killed by the player by jumping on it. Background: Something that has zero collisions and is displayed behind all other objects. After creating your first drawing, click anywhere on the game screen to place your object there. Now, you can create as many objects as you'd like! 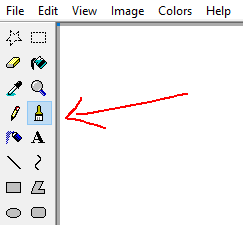 Press the paint brush tool to start making a new drawing. If you aren't sure whether you are in the game screen or the creation screen, just look at the window title. "untitled" is a new creation, while "game" is the game screen. If you aren't satisfied with your current creation, you can press File>Exit to be brought back to the game screen at any time. And if you aren't satisfied with a creation you've already made and placed, just right click on it to delete it! It'd be awesome if you could make a mode that can save what you make, then the editor could reopen it to be played later (I know this is hard I've done it for my own FC). It'd step this up to the next level though.